More than three months after we were first teased with the prospect of Cinnamon Bun Oreos, the sweet -- and perhaps highly breakfast-able -- new cookies are finally about to hit a glass of milk near you. In fact, the much anticipated cinnamon sugar cookie sandwiches landed on store shelves Monday nationwide. 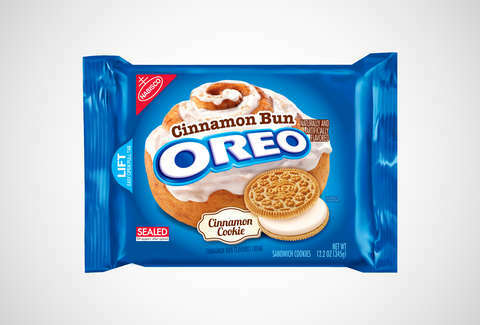 Besides the fact that they're designed to taste like freaking "fresh-from-the-oven" cinnamon buns, these Oreos are particularly notable because they're made with the company's first-ever cinnamon-flavored cookies. But the cinnamon overload doesn't stop there. In the middle, you won't find the classic Oreo filling, but rather what they've described as a "Cinnamon Bun and frosting-flavored crème." So, for a second, you might not feel as guilty about eating one as you would after eating an actual cinnamon bun. Additionally, the wildly anticipated limited-edition Red Velvet Oreos are back by popular demand this week, but this time they're here to stay for a while as an "ongoing offering," according to an Oreo spokesperson. As we noted in our initial taste test last year, the cream cheese-flavored filling alone makes the whole cookie worthwhile. But that's not all the classic cookie company's got up its crumb-filled sleeves, or rather, what they call the "Oreo Wonder Vault," to be exact. As explained in a press release, there's another all-new, limited-edition flavor on the way and the company said it's "unlike anything we’ve done before." Unfortunately, that's all they'd tell us us for now. We'll, or course, keep you updated as we find out more. In the meantime, you can get a peek into this mysterious Wonder Vault thing via the video below. Tony Merevick is Cities News Editor at Thrillist and is gonna need some more milk over here! Send news tips to news@thrillist.com and follow him on Twitter @tonymerevick.